The unconditional affection from a dog is an amazing thing and many times this includes wet dog kisses. Many people who pet your dog will allow and even encourage your dog to kiss them up and down the side of their face. For those who don’t mind this kind of interaction, it can make the child within an adult giggle with glee. Some folks will advocate that a dog’s mouth is cleaner than a human’s mouth and compare it to antiseptic. My father is such a person. However, after observing dogs lick their private parts and ingesting their own stools; I don’t need to consult research studies to determine who has the most germs in their mouth. For this reason, a dog kissing your face is a “bad” idea. The “ugly” part of dog kisses is what this article is really about. Loving affection can turn bad very quickly if the dog becomes stressed. And, how does a dog relieve stress and/or protect themselves? They use their teeth to make the stress trigger go away. 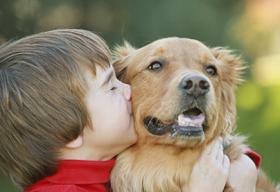 Each year many children are bit in the face simply because they tried to hug and kiss their family dog. The act of pulling a dog toward your face is many times unwanted social pressure for dogs similar to if a person stood a foot from your face while engaging you in unwanted discussion. If the dog can’t pull away, he/she may protect themselves by nipping or biting the invading person or child. 1. The child should ask permission from their parents before petting a strange dog. 2. After obtaining their parents’ permission, the child and parents should request permission from the dog’s owner before approaching to pet a strange dog. 3. The child should allow the dog to sniff their hand that is folded into a fist and held slightly out from their side. This gives the dog the opportunity to approach the child for the interaction rather than the child imposing himself/herself onto the dog. 4. If all things look positive, the child can then place their fist under the dog’s chin and start to pet the underside of their neck and then later move their hand around to the backside of the dog’s neck. Everyone tries to pet a strange dog by going over the top of a dog’s head thinking it is safer to do since the hand is further away from the dog’s teeth. However, it is not safer. In fact, it can cause the dog more anxiety as he/she can’t see where the hand is going. A. If you know your dog doesn’t do well with greeting others, don’t place your dog in the stressful situation of being petted by strangers. If the person approaching your dog is insistent on greeting your dog, be just as persistent in telling the person to stay away from your dog. You are your dog’s guardian in the human world. B. Contact a dog behavior expert if your dog is fearful or aggressive toward others. A professional dog trainer can train you how to use prevention, management and teaching to help your dog become more confident in social situations and therefore, less aggressive. C. Assuming your dog is comfortable in greeting others, instruct approaching strangers the proper way to greet a dog as listed in above lessons #3 and #4. D. Some people who ask to pet your dog are actually afraid of dogs. To help them feel more comfortable, turn your dog’s head away from him/her. This enables the person to pet your dog’s backside so they aren’t anxious about being close to your dog’s mouth. Plus, many dogs love having their backsides scratched. It also allows you to control your dog’s head and therefore, prevent an unexpected and unfortunate snap from occurring. By following the above dog training tips, you can ensure your dog’s kisses don’t turn ugly. For professional dog training, contact Michael Burkey of Michael Burkey’s Canine Behavioral Training at 734-634-4152. This entry was posted in Dog Bite Prevention, Dog Training Tips and tagged dog bite, dog bite prevention, dog kiss, kids and dogs. Bookmark the permalink.